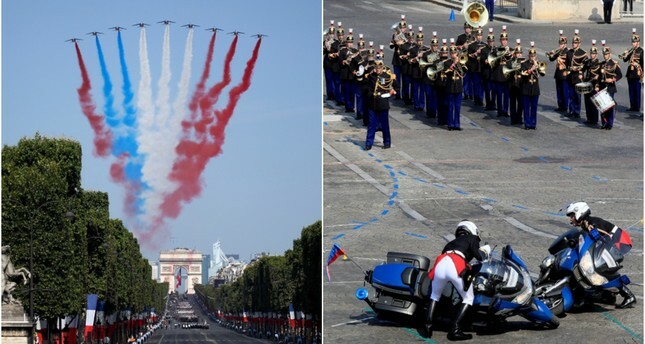 From a new make-over to the French national flag to an unfortunate accident during the independence day parade in Paris, it seemed like Bastille Day celebrations in France started off on the wrong foot Saturday. The unlucky chain of events first started with two French police motorcycles crashing during a demonstration in front of President Emmanuel Macron and other guests at a grandiose Paris parade celebrating Bastille Day. The motorcyclists were part of a group tracing patterns on the Place de la Concorde in central Paris as part of a carefully choreographed performance. After briefly falling down on the cobble-stoned plaza, the motorcyclists righted the vehicles, to applause from Macron and the crowd. Later in the ceremony there was an apparent glitch in the colored smoke sprayed by the French Alphajets of the Patrouille de France. Instead of the tricolor blue-white-red French flag, one of the jets left a trail of red smoke instead of blue, creating an awkward and embarrassing mistake of red-blue-white-red. However, despite these mishaps the pomp-filled Bastille Day event carried on with pride, with thousands of soldiers and others parading down the Champs-Elysees.